Whenever a sequel comes out, it always begs the question, "So is it as good as or better than the first one?" I could count for you on my fingers the number of times this answer has been in the affirmative (Aliens, The Godfather: Part II, Christmas Vacation, The Empire Strikes Back, Terminator II: Judgement Day, ...and that's about it). Thus, most of the time, we get a movie that tries to rehash the same themes with the same characters by throwing some more fuel to the fire. Often, as in this case, it would be a really great movie, had it not been preceded by such a superior one. This leaves us feeling dissapointed rather than gratified because our expectations were set so high. With that said, let me start off with what this movie does better than the original: special effects. The first one had some outlandish effects (such as the helicopter flying through the underground tunnel) but they were never believable and never awe inspiring. However, M:I-2, switches directors (opting for John Woo this time) and brings us a precipitous cliff ascension (made even more terrifying by the absence of music). There is also a daring, yet playful, car chase as well as another great break-in. As the lead villain puts it of Ethan Hunt (paraphrased), "He would rather perform some sort of aerial insanity rather than harm a single hair on a security guard's head." We also see a much more dangerous car chase with some awesome motorcycle stunts thrown in. But the best is the acrobatic fighting. I love that stuff. I could watch that all day. And M:I-2 does a very good job of it. I figured out that the reason that Tom Cruise sports a long hair style is for this one scene in which his hair tracks his foot as he slowly spins across the screen. It is a scene featured quite often in the trailers. There was a lot done to try to save this movie. Once John Woo got a hold of this mistake, he actually did quite well with it. The movie is visually appealing, and the music and sound are top notch as well. I also enjoyed seeing Anthony Hopkins as the Mission Commander, Swanbeck. He was great. Sadly, however, his screen time was cut way too short (that all goes back to the all-Cruise feel of the movie). M:I-2 also brings another beautiful vixen to the screen (which is definitely a must). This time, she is Thandie Newton who plays Nyah Hall (Ethan Hunt's love interest and link to the villain, Sean Ambrose (played well by Dougray Scott). Thandie is quite the babe. Thumbs up! I would also like to address the one aspect of this film which everyone I know has complained about: the face masks. It seems like you never know who anyone really is, because they could just put on a mask and a little thing on their throat and become someone else. It is totally unbelievable, and detaches from any realness the film may have had. To this, I agree; however, I would like to point out that the Mission Impossible series traditionally used this form of undercover work, and if you can accept it for what it is, it can be quite fun. And as another point, how realistic would this movie be without it anyway? It is a fantastic setup to begin with, despite its being set in modern day. But enough arguing. How about memorable quotes? Any really good movie has to have at least one. This one sports three terrific ones that come to my mind. 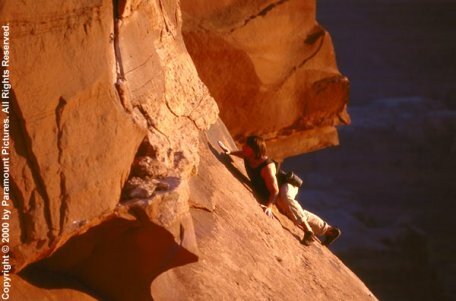 Ethan Hunt (Cruise): "It's too dangerous. She has no training for this." Mission Commander Swanbeck (Anthony Hopkins): "For what? To go to bed with a man and lie to him? She's a woman. She's got all the training she needs." Sean Ambrose: "He would rather perform some sort of aerial insanity rather than harm a single hair on a security guard's head." Don't set your expectations too high, and this movie will be quite entertaining. 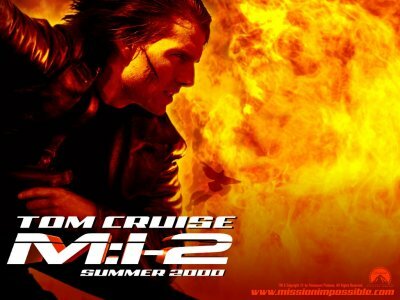 How would you rate the movie Mission: Impossible II? There have been 22493 people to visit this page since Fri, May 26, 2000. And you are the first person to visit this page today!